I realized today that I never got around to showing you my nails, or my sister's toenails, from when I was down visiting last week! So tonight I will share these with you. This is three coats of OPI The Color to Watch, a gorgeous shimmery lilac purple. I really love this color a lot; it is very pretty on the nail. The application and dry time was very nice as well. 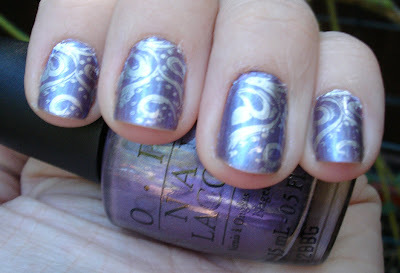 Over this, I used Konad plate m64 with Nicole by OPI Positive Energy, which I have found to be a great stamping silver. I was still experimenting with Konad here, and on this mani was trying to find the perfect scraping strength to apply to get the best results. Therefore, the Konad is a little messy here since it was all experimental. But still I found that this looked very pretty, and was a delicate wispy pattern and color combo. I enjoyed it a lot! I also did my sister's toes while I was visiting. Toes are harder with Konad, since there is no way that the pattern is going to fit on a big toe (at least not any of the people I have tried so far!) so you have to put the pattern on multiple times. I think for the most part this worked out for me, although there is a tiny bit of a gap. Don't forget to enter my giveaway if you haven't already (see below)! Thanks to those who have entered so far. I have some really great ideas for some larger, multi-winner giveaways in the future if I get more followers as well, so spread the word, I really appreciate it! Oh my goodness, Jenny!! This mani pedi combo is fantastic!!! It inspires me to get out my Konad (I think I may even tonight, as much as I should be sleeping instead!). Your header is so totally adorable too :D You cat is gorgeous!! Brooke - Thanks so much! :D I am really enjoying the Konad system, even if I am still learning. And thanks, that is my Bengal Luna, she is pretty adorable. Her brother Leo is also a cutie, I need to get a picture of him up here at some point! Kimberly - Thank you! It is harder to do that big toe, but it can look pretty good with the right pattern and some careful placement. That is really cool! I wasn't so sure about pharmacology at first, but I am really enjoying it. I am looking at natural plant extracts as drugs for leukemia, it's a lot of fun. I am glad to have to following! Glad you like the toes! There is a bit of a gap in the pattern between two different stampings but overall it turned out pretty well!